You’ll want your kids to be comfortable and to stay in a room that’s at least as much fun as their room back home. Our Deluxe Junior Suites are the perfect choice — they feature bunk beds for kids with their own TV. And for the really little ones, we have in-room cribs and pack-and-plays. 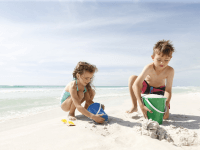 Spending time at the beach or by the pool is a must do at any Destin, Florida family resort. Be careful to prevent sunburns and too much sun exposure, especially with young children. Set your family up under a beach umbrella or in a cabana at one of our outdoor pools. Your kids will be able to play all day in the shade. And if you forget sunblock, don’t worry — you can pick some more up here. All that swimming and playing in the sand can make kids (and adults) hungry. Before you head to the beach, stop by our Coffee Shop to stock up on healthy grab-and-go snack items such as granola bars and fruit. If you prefer lounging by pool, then snacking is even easier. Our Picnix Poolside Market is stocked with grab-and-go items to tide your family over until mealtime. And when it is time for a meal, restaurants in and around our Destin, Florida family resort provide plenty of culinary options to choose from. Check out the kid menus at our on-site restaurants, including Sandcastles, where kids 10 and under eat breakfast for free as part of our daily resort charge. Just because it’s a family vacation doesn’t mean the adults can’t have some alone time. How does sharing a romantic dinner at Seagar’s Prime Steaks & Seafood or being pampered at Serenity by the sea Spa sound? While you’re enjoying some grown-up time, your kids will be having just as much fun. Sign them up for our seasonal daytime Kids Krew program and they’ll enjoy activities like kite flying and sand sculpting and take part in themed events like our Jungle Safari Party and Secret Agent Afternoon. During evenings, our Kids Night Out programs include marshmallow roasting, crab hunting on the beach and stargazing, among other fun activities. 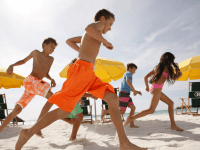 Our family resort in Destin, Florida is also conveniently located near adventure parks, shopping plazas and more. 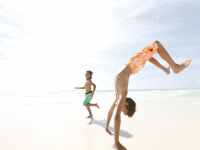 To keep the family fun going even longer, check out some of our favorite, including Big Kahuna’s Water and Adventure Park in Destin and Gulfarium Marine Adventure Park in Fort Walton Beach. And definitely visit Baytowne Wharf, where you can find magic shows on Monday nights and summer festivals every week with face-painting, crafts and fireworks. For even more ideas, check out our top picks for kids under age 5 and our top 5 things for kids to do on a rainy day.